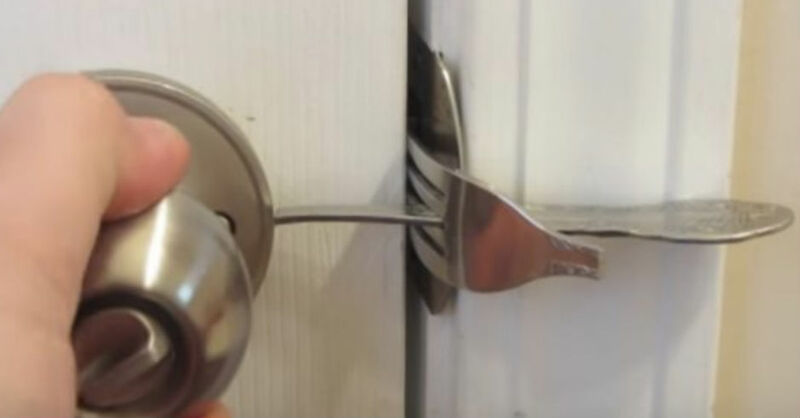 If you need a lock on a door, such as the one in your bedroom, but don't have one, you can beef up your home security with a simple dinner fork. This trick also works well if you frequently stay in motels and other places where you want a little extra peace of mind. To make your own lock, simply start by choosing a fork with tines that are about 1.75 to 2 inches long and a handle that tapers near the fork end. Once you have your fork, open the door you wish to secure and place the fork tines into the latch hole on the door frame. With a marker, mark a line on the tines where they rest when the fork in the latch. Once you've done this, place the fork in a vice with the tines facing down so that you can just see the marker lines over the vice. Grasp the fork by the handle and, with the help of a hammer on the tines, bend the fork to a 90-degree angle. Re-position the fork so that it lays in the vice sideways, securing the handle with the vice. Using a hacksaw, cut the handle off of the fork about one-half inch below where the handle ends and the tines begin. It's that simple: your self-rigged lock is now finished. To use your new it, place the bent tines of the fork back in the door latch and pull them tightly toward you. Shut the door while holding the fork in place. With the door closed, the fork tines will stay in place by themselves. Simply slide the fork handle through the prongs, across the space between the edge of the door and the door frame. Although simple and inexpensive, this homemade lock works quite well. Although door latches are different sizes, your new lock will fit most doors, so you can carry it with you when you travel to be sure you stay secure no matter where you rest your head at night.